From Holocaust survivors, to stroke victims, to the garden-variety centenarian next door, Alisa Kauffman’s patients have one thing in common: an inability to travel to a dentist’s office. So she brings her practice into their living rooms, bedrooms, and kitchens. She padded down a short hallway to rouse him, leaving us in a darkened living room that felt as though it had been submerged in a long-lasting silence. The puffy cushions of a deep upholstered couch bore no body indentations. Canvases depicting vividly painted singers and musicians were muted by a fine layer of dust in the crepuscular light. An electric piano keyboard was propped in one corner, its dials dark. Kauffman D’85, whose trim frame practically buzzes with spare energy during momentary spells of enforced stillness, gripped the handle of the hefty roller backpack she schleps around Manhattan to make her rounds. Inside it, her drill nestled among Tupperware containers crammed with denture molds, filling material, latex gloves, canned compressed air, and all manner of periodontal probes, scrapers, chisels, and the like, sealed in sterile bags. Slung over one shoulder was a white satchel stuffed with water bottles, toothbrushes, a headlamp, and sundry other supplies. She wore blue-gray scrubs bearing her name, and a pair of blue suede loafers emblazoned with the University of Pennsylvania’s crest. Her copper-colored hair was pulled back into a shoulder-length ponytail. In the bedroom, where sunlight poured through the slats of a small fan perched on the window sill, Kauffman’s patient briefly lifted himself to a sitting position on the edge of his mattress. Emerging from his naptime haze, James Johnson (which is not his real name) shifted into the easy charm with which some sociable older men disguise the progression of their dementia. He greeted Kauffman warmly, and bade me to sit in a rocking chair in the corner. It was easy to see how Johnson had come by his affability. His bedroom was filled with newspaper clippings and mementos from a career as a bandleader. After confirming the source of his oral pain, he made one request of the dentist who had come to resolve it. With the poise of someone accustomed to such requests, Kauffman explained that she wore the surgical mask primarily for his protection—and then cut to the chase. “Do you want to see my face?” she asked, slipping the mask down momentarily. “Oh, you’re beautiful,” Johnson replied, with a sigh of pleasure. Up went the mask, and Kauffman placed several instruments on a pale-blue sterile surgical paper towel atop Johnson’s navy blue comforter. “What are you talking about?” Johnson replied gruffly. “I’m joking with you!” Kauffman laughed. The next 20 minutes unfolded with an uncanny mixture of complete predictability and utter weirdness. As Kauffman drew a quantity of septocaine into a needle syringe, Johnson clenched his body. “Oh God,” he groaned. His daughter walked over to a bedside CD player. “Do you want some music?” she asked. “Depends on what you want to play,” her father said. “We’ll play one of your things, so let’s see…” She plucked a CD from a pile as Kauffman stuck Johnson with the needle, eliciting a quick, sharp cry. The little stereo now swelled with the iconic clarinet glissando of George Gershwin’s “Rhapsody in Blue,” and Kauffman set about her work. Hunching over Johnson, with one knee digging into the mattress, she asked his cheerful home health aide to lie on the other side and restrain Johnson’s hands. She pricked him once more with the needle, and he yelped again. “Take the soup out?” Johnson exclaimed. He chuckled and visibly loosened his limbs. Waiting for the numbness to set in, Kauffman bantered for a minute with her patient, who gradually lost track of the conversation amid the first big crescendo of the Gershwin composition. Then, with no-nonsense efficiency, she reached into Johnson’s mouth with a pair of dental pliers and yanked out a crown spanning three molars. “You didn’t even have time to scream,” Kauffman playfully retorted. The crown’s existence was news to Johnson’s daughter, who presently began taking notes. The removal of the crown had exposed three bloody root tips, and Kauffman said they all had to come out. One after another, she tugged them out with the heavy-duty pliers. The physicality of dentistry, the raw force it takes to pull teeth out of someone’s jaw, is striking to behold. Watching it happen to someone else can be even more jarring than undergoing it yourself, because the dentist’s bodily exertion is so fully revealed in the clenched muscles of her arms and neck and shoulders and back. Johnson’s daughter, queasy at the sight of broken root tips landing on Kauffman’s disposable blue towel while blood pooled in her father’s mouth, disappeared into the living room to lie down. Then, with a quick bottled-water rinse and a wad of gauze tucked into the wound, it was all done. Kauffman gave the health aide some instructions about what Johnson could and shouldn’t eat and drink over the next few hours. To Johnson she said, “Sit there and try to look pretty while I clean up!” He laughed. 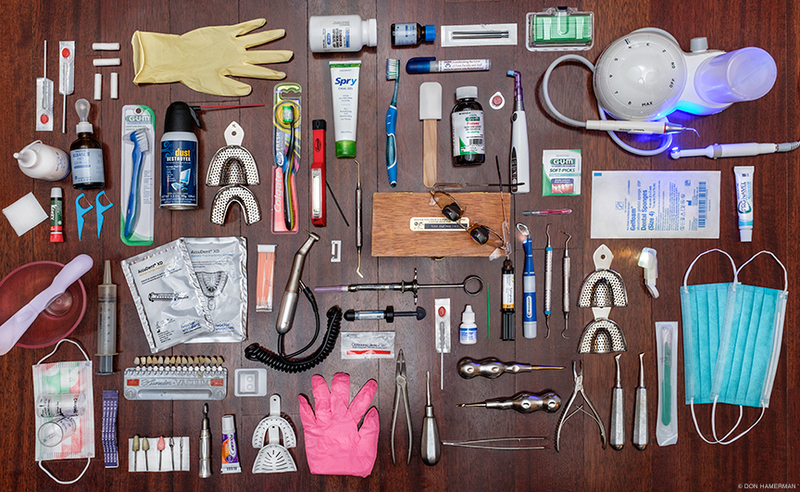 She packed up her tools and medical waste. Before she could leave the bedside, Johnson grasped her hand and froze for a moment, as though he wasn’t quite sure what to do. Then he slowly raised it to his lips and gave it a chivalrous kiss. Kauffman has devoted her career to “the old old,” as demographers call the fastest-growing segment of America’s senior-citizen population. She estimates that the average age of her patients is 90. She cares for them in a setting that’s even more unusual for dentists than for doctors: their homes. Kauffman also showed me a video that she shares (with permission) with her students at the Dental School, where she’s a clinical assistant professor in the community oral health division. It was a recording of a conversation she’d had with a patient suffering from advanced dementia. She was an elderly woman with untamed white hair, blotchy skin, and a scratchy, nasal voice that made me think immediately of Miracle Max, the wizened old potion-mixer portrayed by Billy Crystal in The Princess Bride. “The most horrible dementia,” Kauffman said, setting up the clip I was about to see. “They either get really nice or really mean. Her son never got married, which she just couldn’t handle, and she lost her lower partial, so I had to make her a new lower partial.” I didn’t quite follow the connection between her son’s bachelorhood and her denture problem, but before I could interject, the story gained an additional layer of complexity. “It was that snowstorm a few years ago, where nobody could get out of their house for days. And I got there, and she wouldn’t let me put the partial in her mouth unless I lied to her,” Kauffman said. “Oh, I have to do a lot of lying,” she explained. Some patients can’t bear to spend a dime on themselves, no matter if they’re as rich as Croesus, so their children beg Kauffman to tell them Medicare will pay (which it doesn’t, unless a dental problem evolves into a medical emergency). If a patient refuses to let Kauffman touch him, she might pretend to be his daughter’s friend, coming all the way from her office to do a personal favor. And of course like every dentist who’s ever drilled a cavity, she tells people they’re only going to feel a tiny little pinch. The video depicted their conversation afterward, as Kauffman attempted to make sure the new prosthetic was not causing pain. Kauffman: How do your teeth fit? Patient: I don’t want you. K: How do your teeth fit? P: I don’t want you. K: But are your teeth fitting well now? K: Are your teeth fitting well now? K: So you love me? K: I fixed your teeth. K [laughing]: Well, you’re not easy, you know! P: I can go to the synagogue with them. you couldn’t go to the synagogue! P: Alright, go. Go, go, go. P: Go wherever you want. K: Where do you want me to go? P: Wherever you want to go. K: I want to be with you! P: I don’t want you, I don’t need you. K: You do! Yes! Yes! We love each other! P: Okay, go to the synagogue. P [pauses, then suddenly softens her tone]: Me too. “When you hit 100, there’s no filter,” Kauffman says. That’s the joy and the challenge of her practice, which is restricted to patients who are physically or mentally incapable of traveling to a dental office. But frequently a difficult one. “There are skills that you can only develop over time working with this population,” she continues. “You have to be so patient, you have to be so kind, and you have to have the time. If you have a patient with dementia coming into your office, there’s no way—with all the patients in the waiting room—that once that dementia patient starts to scream, you can bring them in, sit with them, calm them down—while they’re still screaming and the rest of the patients in your waiting room are listening. Jessica Meier D’12 trained under Kauffman at LIFE, a West Philadelphia public health center that serves independently living seniors which was run at the time by the School of Nursing. (It was acquired by Trinity Health PACE in 2016.) The experience gave her a lasting appreciation of the challenges of geriatric dentistry, particularly for patients with complex medical histories. When I accompanied Kauffman on a series of home visits in Manhattan, I watched her care for an elderly woman who’d lost the power of speech and the control of her body to advanced Lewy Body Dementia, whose cognitive and physical impairments resemble Parkinson’s Disease. We encountered her in an Upper West Side studio apartment, where she lay quietly in a hospital bed. Her daughter and a home health aide were present. An old upright piano abutted one wall, and ragtime piano music played on a small stereo. “The last things to go are prayer, poetry, and music,” Kauffman remarked later, in a sober moment in the hallway of the apartment building. She had confided that caring for this patient, who was “the same age as my mom,” took a heavy psychological toll. “Why?! Put it on after brushing,” Kauffman urged. Later, she gave the younger women a xylitol spray to try instead—pumping a sneak-attack spritz into their mouths before they had time to react, hoping to sell them on its pleasant flavor and ease of use. “She has a very high palate, so if she doesn’t drink a lot, you’ll get a little yeast in there,” Kauffman now told them. “There’s a little in there now.” She demonstrated how to swipe it out without triggering a gag reflex. A minute or two later, when the patient did gag, Kauffman quickly withdrew and, in a simple gesture that was eloquent with tenderness, massaged her shoulder for an extended moment before resuming. Next came the tooth polisher—“Here comes the fun part!” Kauffman exclaimed. Kauffman’s journey into geriatric house-call dentistry— a term whose top Google result is a link to her Manhattan practice’s website—was equal parts fate and happenstance. “When I graduated from Penn, I won all the accolades for making the best dentures—which was kind of like a booby prize” she laughs. “Everyone was doing cosmetic dentistry and full-mouth reconstruction, and there I was, doing dentures. But I loved doing it.” She liked hanging out with the lab techs who helped craft them—even if it meant enduring airborne carcinogens “back in the days when they were smoking in the lab”—and the work appealed to her artistic side. When she isn’t working or teaching, Kauffman makes jewelry and paints. The patient encounters I witnessed bore that out. There was a chatty and occasionally profane 88-year-old woman, who complained—with more than a touch of drama—about “screaming” pain inflicted by new dentures that her home health aide privately confided she had not worn at all, but reminisced about dining on beef Bordelaise. Kauffman tuned her pitch to her patient’s personality: “Getting old is not for sissies!” she exclaimed. “You’ve got to be tough!” Kauffman likes to tell her spunkiest centenarian patients that she’s going to make them “look 90 again.” (“She’s a honey,” the patient told me. “I’m kind of on the old side—but you get someone in that’s sparkly and bubbly, that you can kid around with.”) Another patient was turning the pages of Fine Cooking magazine when we arrived, and had issues of Saveur and the like stacked on his kitchen island. A couple years after Kauffman graduated from dental school and set up a traditional brick-and-mortar practice, the father of one of her best friends had a stroke. Her friend didn’t know what to do about his dental care and asked Kauffman for advice. “I said, ‘Well, why don’t I just come over and do it?’ And she said, ‘You can do that?’ And I said, ‘I’ll figure it out.’” She obtained his most recent x-rays, assembled a mobile kit, and cleaned his teeth as he lay in bed. It became a regular thing. Around 2000, Kauffman got an unsolicited offer to buy her practice. She was now the mother of a five-year-old daughter. She sold the practice, and started to look for geriatric patients like her friend’s father. She went around to hospitals, and eventually became affiliated with Lenox Hill and Mt. Sinai, both in Manhattan. She put together a tool kit that now runs from a portable suction apparatus to a state-of-the-art piezoelectric tooth scaler. Apart from procedures like root canals and impacted teeth, which require a degree of emergency medical support that’s not possible in a home setting, she can do “almost any service” offered at a traditional office. By not maintaining one of her own, she lost overhead costs and gained greater control over her schedule—which was attractive as the parent of a young child, and for patients who wanted or needed care outside ordinary business hours. She practices in Manhattan, where she can get around via ride-sharing services and on foot. Dentists willing to make house calls are rare enough that Kauffman says she gets calls from people as far away as Mississippi asking about her services. “In major metropolitan areas, there’s probably only one dentist that will do it,” says Meier, who has a traditional private practice in Philadelphia. “Dentistry’s hard enough in and of itself. When you complicate it with people who are difficult to work on, it’s just very difficult. You have to really be in shape, and be able to treat patients who can’t go back all the way. It’s really tough on your neck, on your back, just on everything to be able to try to perform these services for people in complex circumstances. “And you have to remember too, you’re dealing with your malpractice insurance,” she adds. Dental offices are very controlled environments. People’s homes can harbor surprises ranging from spatial constraints to bedbug infestations. Kauffman told me about one patient, a hoarder, whose apartment was so overwhelmed with accumulated debris that the only way the patient could receive treatment was by sitting on a kitchen stool with her head against the refrigerator. “It takes a lot of will and drive to want to be able to do that,” Meier says. Yet for Kauffman, it’s a calling with unique rewards. She likes to point out that, whatever ailments may be afflicting them now, her patients are survivors. And over the years, Kauffman has become interested in what accounts for their longevity. So she’s become a collector of elder wisdom. And so she keeps seeing patients, one home visit at a time. “As long as my back stays strong,” she says, “I’ll be okay.” The 57-year-old allows that she won’t be able to carry on forever—and has already run up against the limit of what she can do on her own, especially facing a growing demand that she expects will mount further. The American population continues to grow older, and the oldest senior citizens increasingly survive significant impairments to their mobility and cognitive health. She has lately been looking to bring on a partner in her own practice [see sidebar, pg. 38], and continues to evangelize the merits of geriatric practice to her students at Penn. 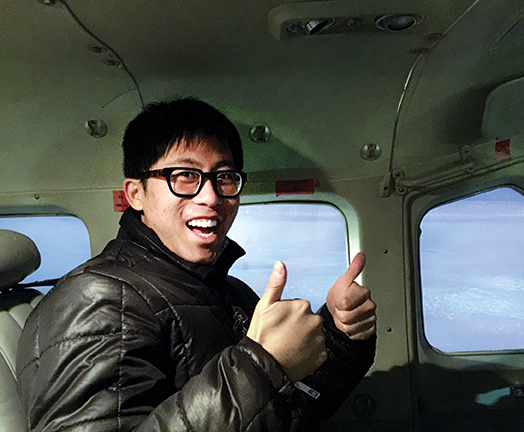 “I have the world’s most unusual dental job,” says Steven Lin D’15, who certainly has one of the most unusual commutes. Traveling by bush plane and plying remote roads in temperatures that can fall far below zero, he helps to care for the teeth of some 30,000 indigenous Alaskans in settlements spread over a wilderness as vast as Texas. Since 2015, Lin has worked for the federal Indian Health Service. Packing portable dental equipment into a five- or six-seat Cessna, his team ventures into the Alaskan outback for five days at a time, providing everything from oral surgery to community-based public-health education to communities that are in some cases so far off the grid that overland travel to Fairbanks is impossible for much of the year. 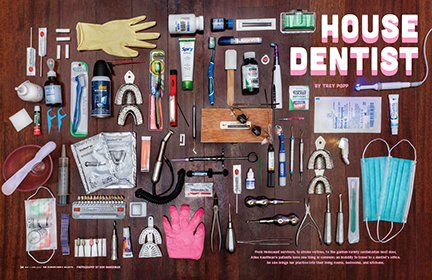 He frames mobile dentistry as a disruptive public-health model. “The traditional dental model emphasizes patients making appointments to come into offices. And what if you can’t come in? Well, sorry, we can’t treat you. So the public-health approach is to come up with a radically disruptive mechanism in order to get people where they need to go. 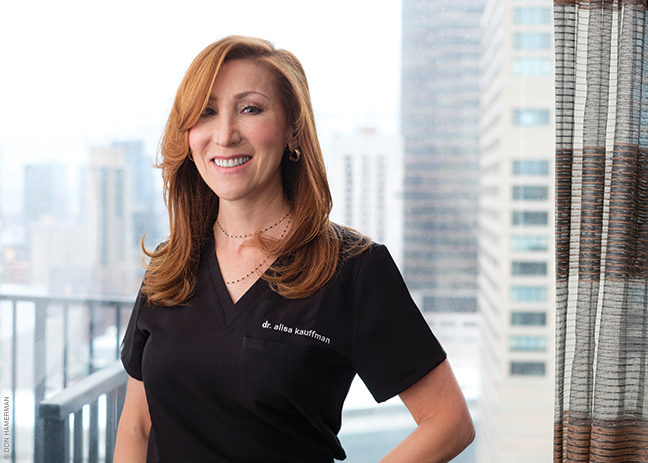 Lin credits Alisa Kauffman with awakening him to alternatives to the traditional dental model. His work for the Indian Health Service has deepened his appreciation for the cultural dimensions of oral health. “Alaska’s indigenous communities have had a continuous culture for millennia. Three generations ago, they didn’t speak English and had no contact with the outside world. But the modern civil society they grow up in now is very different from what it was like 60 years ago.” And one of the biggest differences is dietary. “Processed foods and other elements of the non-native diet have decreased the ability of their teeth to withstand the day-to-day chewing and grinding forces,” while playing a role in the rise of chronic health conditions like diabetes and heart disease. “In particular, many native communities eat very tough meats raw or hardened jerkies, and one of their biggest sorrows is without healthy teeth, people are unable to appreciate the native diet. So poor oral health is accelerating the decline of native cultures. Come this fall, however, Lin will be trading the Alaskan outback for a quite different terrain: the outer boroughs of New York City. As of January, he was planning to join Kauffman as a partner in her practice. “Since the practice concept is unique, there are many details to be ironed out,” Lin wrote in an email. “It is our mutual goal to expand the practice from Manhattan to the other boroughs and beyond. We want to not only become a clinician team but also advocates and innovators in geriatric healthcare to other professionals in the future.” —T.P.